The scene of riot police brutally beating up demonstrators who have risen up against years of oppression is hardly surprising under the circumstances. At many moments in history, angry protesters or a structured opposition have managed to remove an authoritarian ruler, to shake or even to eradicate whole regimes. Those are the moments that regimes fear the most: they become important thresholds in the history of nations. As history progresses, artists and literary figures draw inspiration from those moments, immortalising the villains and their fall in a variety of artistic forms for later generations to look into and reflect on. Such is the case with Alexander Pushkin’s Boris Godunov (1831), which in its turn inspired Modest Mussorgsky’s opera of the same title. Boris Godunov, ruler between 1585 and 1598, tsar of Russia (1598 – 1605), is suspected of having ordered the murder of the lawful heir to Russia’s throne to secure the succession for himself. Though under his reign the country witnessed a number of important reforms, state officials gained wealth and power at the expense of the people; and Godunov’s popularity was constantly challenged by deteriorating living standards of the poor. In his seventh year on the throne, an organized opposition group succeeded to remove him from power, and soon his son was assassinated. The country fell into years of troubles. 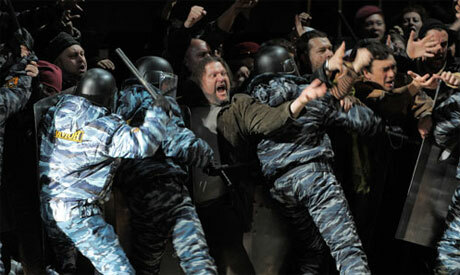 Boris Godunov has become one of the most popular Russian operas worldwide. Once and again it proved to have the power to inspire; while due to its thematic content, its adaptation might be troublesome to some authorities. It is at the crossroads of art and politics. On the stage of the legendary Marrinsky Theatre in Saint Petersburg, even now Boris Godunov meets Vladimir Putin, who for months is among fundamental reason of protests in Russia. On 28 May 2012, AFP reported: “Russia’s legendary Mariinsky Theatre has surprised audiences with a new production of a classic opera that draws parallels between a ruthless 16th century ruler and Russia’s current regime.” The opera, directed by Graham Vick, had premiered on 25 May on the stage of Mariinsky Theatre in Saint Petersburg, the same stage where the Boris Godunov opera had first premiered back in 1874. “It is extremely rare for major Russian opera houses to make contemporary political references in their productions. The starkest reference to present-day Russia comes in the uniforms of riot police, or OMON [a generic name for Russian police: Special Purpose Mobile Unit], who protect Tsar Godunov and his family from a throng of angry fist-shaking citizens. While many of the set details allude to the late Soviet perestroika years, when Russia was hit hard by economic crises and mass rallies, elements like a monk with a laptop or the lavish icon backdrop are more typical of Vladimir Putin’s era of Internet and growing power of the Orthodox Church,” AFP report continued. The opera’s adaptation has provoked a huge stir and the news spread like wildfire. The Guardian headline read “Protests against ‘tsar’ Vladimir Putin reach operatic stage;” Moscow Times noted: “Riot Police, Hipsters Star in Charged Boris Godunov”. Boris Godunovis an example of how art can be at the core of deep political reflection, and how it can provoke strong engagement of the audience. Some believe that art is neither interesting nor valuable if it doesn’t provoke. Art has the power to address the audiences’ aesthetic senses, as well as awaken or feed a socio-political stance. Such provocation becomes an important precipitation for our senses often trapped in the mechanical processes of thinking and analyzing. Though Dr. Nehad Selaiha, theatre critic who writes for Al Ahram Weekly, is better equipped to tell us about the role of theatre in social and political change, it is well to recall an incident from 1968 Poland that witnessed staging of Forefathers’ Eve (Dziady), a 1824 poetic drama by Adam Mickiewicz, widely recognised as one of the most important works of the European Romanticism, and placed by George Sand in parallel with Goethe’s Faust. Director, Kazimierz Dejmek’s 1968 interpretation of the iconic national work, drove the regime to address series of attacks against the Warsaw’s National Theatre accusing the director of promoting anti-Soviet and anti-socialist ideologies as well as Russophobia. Briefly, Dejmek’s adaptation was at the heart of one of the large protests against the communist regime, organised by students, artists and intellectuals, which swept a number of major Polish cities. Though the regime managed to suppress that particular wave of anti-communist revolt, and the Communist Party tightened its grip on academic curricula and the activities of cultural institutions in Poland, after that moment, intellectuals never resorted to silence again; and they continued to contribute to the fall of the regime with their art. Boris Godunov in today’s Russia and Forefathers’ Eve in communist Poland are among many examples of artists’ reaching out to known texts in order to turn them into a moving commentary or an active participation in the political situation. Understandably, the artists and intellectuals’ craft can and should become a tool to comment on the surrounding realities, it is a weapon that can move thousands if not millions in the longer term, inviting them to voice or endorse an opinion and accordingly leading to the desired change. Looking at the protests against Putin’s thirst for power and how it is depicted in Boris Godunov, directed by Graham Vick, remembering contribution of artists and intellectuals to tearing down a half century-strong communist wall, one cannot avoid drawing parallels with the past 18 months of Egypt’s history. As much as many individual and independent Egyptian artists try to reflect on the political turmoil, there are many artistic institutions in Egypt that, so far, have not sufficiently contributed to the social-political changes taking place in the country; equally there are many creators who did not use their knowledge and knowhow in a way that would set forward a sturdy creative opinion generated by and immersed in the political reality. Repertoires serving such cause are endless, whether from the international or Egyptian sources. Understandably, news about Boris Godunov made me think about the Cairo Opera House; hopefully it will still come through with powerful creative propositions not limited to mere re-makings of the canonical repertoire.